Information is like oxygen, it has been said. It can’t be stopped by walls or barbed wire, and it has the power to wake the groggy and revive the listless. Not everyone uses it well, of course. But anyone who has read The Onion‘s recent report that “Most of Earth’s Oxygen Is Used for Complaining” will be glad to know there are people who use oxygen for higher purposes, recirculating it back into the community in the form of social support and education. In my view, whenever someone lives and breathes to help others, they stand as examples of people who use the oxygen of information for a positive purpose. And if they do that through their blog posts, which—thanks to the nature of the Internet are likely to be around for a good, long time—they are planting seeds for forests that will freshen the air for years to come. That’s why I’m honored to have the opportunity to showcase some particularly oxygenating blogs as I nominate some of my favorites for the Liebster Award. There are, of course, a number of awards that are shared among bloggers, and each has its distinctions. 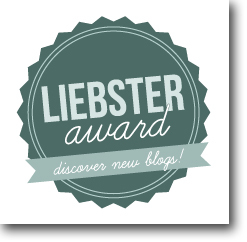 What I love about the Liebster award is that it’s intended for up-and-coming blogs of value: the kind that have the potential to breathe new life into the blogosphere by offering the kind of information that can be life-giving, life-changing. The blogger who nominated me for the Liebster certainly belongs in this category herself, and I’m honored to think she feels the same way about me. We’ve never met, but I have been following her blog and Twitter feed for some time. She is Sam Ross of Teenage Whisperer. What I love about this blog is that it drills very deeply into one area that I cover, but Sam covers it in far more depth than I’m able to from my birds-eye view. While I talk about attachment, relationship-building, and child development in general—sometimes touching on adolescent issues—Sam’s life work is to help troubled, disengaged, challenging teens (and to teach others how to help them effectively too). This is a group of children who are often thrown away by a society that tends to assume there is no hope for them, no help—a society that doesn’t believe in personal change after a certain stage of development. They need people like Sam—and they also need for people like the rest of us to read Sam’s post “My Consumption, Your Compassion.” Thank you so much for this post, Sam, as well as for the nomination. Now it’s my turn to fulfill part of the responsibility that comes along with this nomination. To be eligible to display the award, of course, you have to pass the love along. If you are one of the nominees I’ve listed below, here’s how to accept this award before displaying it on your blog. This is a collaborative effort by a number of bloggers dedicated to fighting the stigma surrounding mental health issues. These writers, who candidly share their own struggles and epiphanies, share Mom Psych’s passion to cut through the myths and misconceptions to educate the public about mental health and support healing and understanding. For example, I offer this post from a Canvas blogger, titled “In Loving Memory,” which addresses some of the misconceptions about suicide. Apart from genetics, the parent-child attachment bond is a key environmental influence on mental health and well-being, and Colby Pearce—a clinical psychologist in Adelaide, South Australia—writes about this topic with passion, insight and experience. One of my favorite posts from this blog is “Kindness is Magic,” because it illustrates why I place such a high value on the information Colby shares here. “The way adults treat any generation of children shapes the way those children will, in turn, treat the next generation when they are adults,” he writes. “It follows that if we are seeking to create a more gentle, humanistic world we adults need to pause and reflect on how we interact with the current generation of children.” This information is not only for parents. It’s for everyone who hopes to contribute to healthy communities and a kinder world. I go to this blog whenever I feel myself beginning to slip into “Easy-Button” perspectives toward complex mental health issues. Written by Adrienne Jones, who studied sociology and creative writing at The University of New Mexico, NPS addresses mental health from deep in the trenches. “I created No Points for Style so that I would have a place to write and share my experiences raising a child who has a serious mental illness,” Adrienne writes. “Over time, No Points for Style has become a place for me to write about much more than mothering Carter. It’s a memoir-in-progress where I share life as it is happening now, and also life as it used to be, exploring my experience as a bully victim, my first marriage, and my aunt’s violent suicide when I was 8 years old, among many other things.” Adrienne’s approach is honest, straightforward and unapologetic. Her blog will expand your capacity for empathy in ways you’ve never dreamed about. I was fortunate to have the opportunity to meet Adrienne at Blogher ’13 in Chicago. She’s as genuine in person as she is in her writing. If it seems self-serving for me to nominate a sister-blog—or quite literally, a sister-in-law blog—the simple truth is there really is no other blog that I could find that illustrates so well the vital importance of aunts, uncles and extended family to the well-being of children. (I did try to find one). Few blogs focus on these often-neglected family members, and certainly not with the humor and rapier wit of the woman my brother married. As proof, I offer two of my favorite posts from Jo. “Sneakiness Is Not Genetic . . . RIght?” and “Teaching Friendship through Physical Contact and Body Language.” You’ll definitely want to bookmark this one.